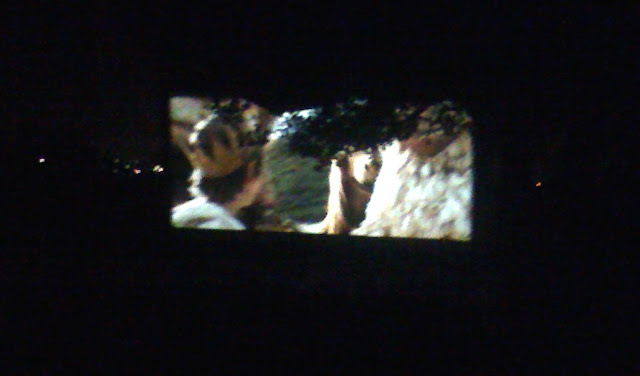 I saw Where the Wild Things Are at the Moonlight Cinema last night. Enjoyed the "branch feature" in front of the screen. Was "part of the experience". Felt like i was in the movie, felt like a Wild Thing - felt a sense of verisimilitude. The movie took me to my childhood. Remembered reading the book and wondering why Max wore a wolf costume and hung out with monsters. Wanted to be avant-garde like him - a real hipster. At the film's climax ppl in the crowd sniffed and wiped away tears. When it ended we all got up and walked home through Centennial Park. Much of the movie was filmed in Melbourne. The landscapes used in the movie are sparse. Like much of Australia, flat terrain and lanky eucalypts populated the characters' dream world. As we walked through the park the eucalypts and monochromatic light used in the film sat in every direction like gallery frames. Were were in Max's world. The grey moon wept as i remembered my burning face being pushed into grass by an older boy when i was nine, intense butterflies when my heel-wearing Year 2 teacher wore mini-skirts and singing a love song i wrote when i was six, after my mum introduced me to The Beatles. Then it occured to me the car was very far from the cinema, and i became a man again. Trying to get Z into Abbey Rd. Failing hard. Not enough 'twee' in it. Abbey Rd = best Beatles album. Yes. Find it hard to fault.